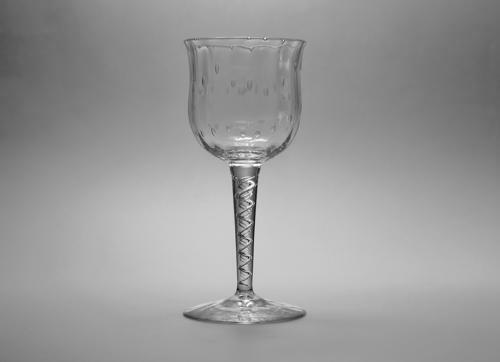 Wine glass with trapped air technique. The bowl with random bubbles and an air twist stem with optical ribbing to foot. Designed by Harry Powell C1880’s. Made by J Powell & Sons Whitefriars. A similar glass is illustrated in Whitefriars Glass James Powell & Sons of London by Wendy Evans, Catherine Ross & Alex Werner 1995. P.79, Plate 78.